My dream is to one day have a ‘big idea’—one that helps others, contributes to my community, or changes society for the better. In the meantime, I feel like I need to get back into the habit of making time to think things though, even if the problems I’m trying to solve seem trivial. It’s all good practice for that day when a big idea comes along. Last week’s Rabbit Hole was about children in Australian immigration detention. Topic-wise, it was hard to think of something to follow it. I didn’t want to write something trivial in comparison, but then again I didn’t want the next post to be as depressing either. At the same time, I’ve found myself thinking a lot this week about how many people on the other side of the debate say that compulsory offshore detention saves lives because it acts as a deterrent. Personally, I don’t think it is the solution, and it’s a pretty poor state of affairs if children have to suffer as a result. And since there are even more massive social, environmental and economic upheavals to come, new ideas and new thinking are the only way we are going to survive. That’s not to say this week’s blog is going to be about solving the world’s problems—I just wanted to spend a little time thinking about thinking, and have something to remind myself to do it more often. There was this group of lawyers in Brazil who were trying to prosecute ex-members of the military-government for human rights violations. (Please note—I’m the most unreliable of unreliable narrators. If any of these stories bear any resemblance to fact, know that, if I’m speaking about the history of Brazil, I might be talking about the history of Paraguay, and if I’m talking about Paraguay, you might as well assume I’m giving an accurate description of the history of Mars. The story goes that in Brazil during its 21-year long dictatorship, tens of thousands of people who opposed the government were detained and tortured, and it’s believed that hundreds of these people were executed without trial. These forced disappearances were done with such expertise and efficiency that no trace of these people were left. Many families still have no clue what happened to their loved ones, nor have they had the closure of a body to bury. No one has ever been successfully tried for these crimes, partly because of an amnesty that was granted to those responsible for the atrocities—an amnesty that was signed into law in 1979 by the military government itself. Flash forward to 2012, and many Brazilians are still grieving and angry. They know exactly who’s responsible, but because of the amnesty, no one can do anything about it. So, knowing full well that the amnesty is a brick wall, a group of lawyers came up with an alternative. They instigated a test case, and brought charges against a former army colonel who they believed oversaw the murder of five guerrillas in 1975. But, instead of accusing him of killing the five men—which they couldn’t prove because the bodies were never recovered, and if they could prove it the amnesty would absolve those involved of any wrongdoing—the lawyers argued that since they could establish that the Colonel oversaw the five men’s capture, and no remains were recovered, then as of 2012 the five kidnappings could be considered as ongoing. It’s a very fine point, but a brilliant one. Unless the colonel could prove the five men were dead, or still living, he was still responsible for their well being and not protected by the amnesty. Edward de Bono, the very well known author of more than fifty books on lateral and creative thinking, has another story. de Bono was approached by a government body in the US to come up with a way to reduce river pollution. He noticed that factories that were positioned on rivers used the waterways for two things: 1) they needed draw in fresh water for production; and 2) they needed the river to carry away contaminants. This meant that clean water flowed into the factories and dirty water flowed out in such a way that was very efficient for the factories themselves, but not so great for the long-term health of the river, nor for those who lived downstream. Looking at the problem, de Bono saw a solution—factories, obviously, should be built downstream from themselves. His idea was that if the factories were forced to draw in their own polluted water, then they would have a greater incentive to ensure that pollution was kept to minimum. The whole idea of placing a factory downstream from itself sounds logically impossible—that is, unless you make one slight alteration. de Bono suggested that all factories should be redesigned so their outflow pipes were rerouted upstream, above their inflow pipes ... Et voilà—you get the same effect. Genius. I wish I could come up with ideas like these. Looking at the factory pollution example, there’s no way I could have sat long enough with the idea of a factory being downstream of itself to get to the final solution. But now the solution seems obvious. I guess for great ideas to come into being, we need to be comfortable allowing the impossible to exist before the possible can. I think the Brazilian case is a particularly good example of creative thinking because if I was faced with the same problem, my sense of the injustice of it all would have blinded me and I’d be unable to see any other solution. But that’s not to say that emotion doesn’t have a role to play in thinking. According to developmental psychologists like Howard Gardner, there are many different types of intelligence. Instead of relying on, say, just verbal, visual and logical modes which most of our schools and universities are geared towards teaching, educators are slowly paying more attention to other modes that include emotional, bodily, interpersonal and intra-personal (self-awareness). Gardener in his influential 1983 book, Frames of Mind: The Theory of Multiple Intelligences, even talks about a musical-rhythmic and harmonic intelligence, and in later books talked about innate propensities towards more natural/environmental and spiritual modes of understanding the world. If it follows that there are multiple intelligences, then there must be ways of calling on these through thinking. Instead, de Bono recommends we should give equal time and attention to each style of thinking to hear what it has to say. It’s been a while since I read his book, but I used to use my own version of his method to try and diagnose my own problems. From memory, there are basically six different ways of looking at a problem, and de Bono assigns six different colours to make them easy to remember. The Six Hats method looks something like this. It can be done in any order, and for as long as you like. But I like doing it this way and only for twenty minutes to half an hour. Administrative (Blue) — I use this one for figuring out the question I want to solve. I see this mode of thinking like a very efficient and patient facilitator in a group meeting. Using this type of thinking, I try to set the limits of the problem. Factual (White) — What are the facts? Only real, neutral, quantifiable details are needed. Emotional (Red) — How do I feel? How do other people feel? Critical (Black) — This is a tricky one. It can mean being negative. It can mean being harsh. It can also mean being realistic, cautious and conservative. Positive (Yellow) — With this one I try to imagine if everything went right—the best possible outcomes. Creative (Green) —Here I try and think up all the crazy, creative ways I could solve the problem. The goal here is to find some simple, practical actions that are going to bring about the changes I want. It’s great having the creative mode last because here I try to bring together all the strands created by the other ways of thinking, and make something out of them. 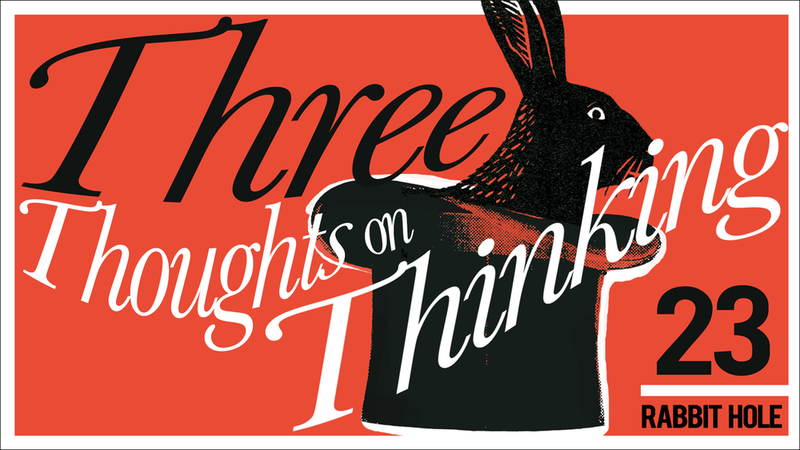 And finally, why did I choose the title “Three thoughts on thinking”? Well, three sounds better than two, and just one sounds lazy. I made a commitment to having three ideas and waited until the third one came. Make time and space for an idea, and it forces you to come up with one.